The days of keeping a closet full of sneakers to match every outfit you own might be coming to an end. We have the technology. The Shift Sneaker prototype from creative tech firm +Rehabstudio acts like a chameleon on your feet. Thanks to a series of programmable miniature LED lights woven into high-tech fibers, the shoes’ material you can reset the color scheme of your sneakers any time you want. 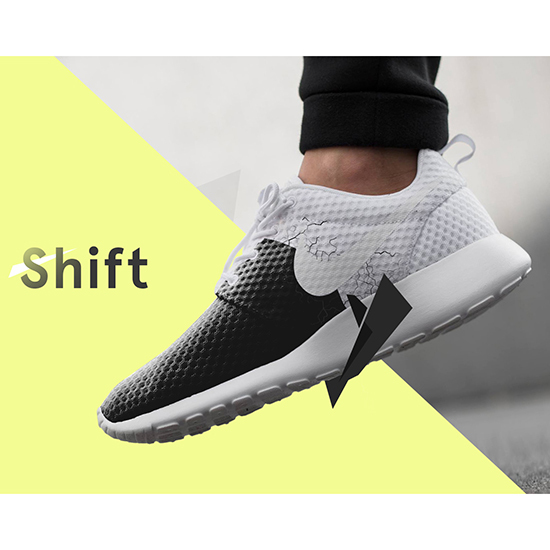 Unquestionably the best use of lights in footwear since LA Gear, Shift Sneakers use an app called Pack Store for easy design customization. The app comes preloaded with a few additional techie options. The “Connection Pack” feature will let you and your partner match each other’s shoes into one seamless design and the “Selfie Pack” will actually let you snap a picture of yourself and the get the sneakers to automatically generate a matching design. +RehabStudio showed off the shoes at their hack week. And while the Shift’s technology isn’t ready to show up in your local sneaker shop just yet, we’d expect someone to pick up the idea and run with it. The world is clearly ready for some wearable tech that actually looks good. Plus, if LA Gear really is still selling LA Lights for $110 a pair, sneakerheads are definitely ready to pay for it.